The Enterprise Class is the current Command Battleship and Carrier design utilized by Starfleet. The Enterprise Class starship is one of several designs developed by the Starfleet Corps of Engineers to serve as the next generation exploration platform and command vessel for the Federation’s Starfleet. The initial design briefings called for a large vessel - the largest starship ever to be produced by Starfleet at the time - designed to perform long term exploration assignments on behalf of Starfleet and also capable of providing a Federation presence in galactic hotspots during times of hardship. This varied design brief would result in starships of this class becoming one of Starfleet’s most prominent designs for the near future and one of the most important starships ever constructed by the United Federation of Planets. In a military sense, the Enterprise Class starship is a somewhat impractical design since a smaller ship could fulfill the same mission duties just as effectively as the Enterprise could. Additionally, due to the size and nature of Enterprise’s mission, it would be a very difficult project to efficiently execute. Resource wise production of one ship of this class would require the same amount of materials needed to build an entire Task Group of Century Class vessels and nearly double the crew compliment that would be needed for such a Task Group. Further, several separate drydock construction facilities would be needed to construct the massive Enterprise as, when completed, the vessel would be two and a half times the size of a Galaxy Class Starship and nearly 4 times stronger than the Federation’s Sovereign Class Heavy Battleship. The size and capabilities of the Enterprise were mainly driven by politics; as the flagship of the United Federation of Planets the Enterprise would represent the Federation on the galactic stage and would serve as physical proof of the Federation's capabilities, power, and resources to those it encountered. It was also hoped that the sheer size of the ship would frighten potential opponents into a less hostile stance – similar to how the starships of the Romulan Star Empire utilized their frightening bulk to strike fear into the hearts of potential threats. Because of its importance to the morale of the Starfleet and the Federation itself, defense would also prove to be a paramount issue for this new vessel as well. The Enterprise Class Development Project would call upon the creation of the most advanced shielding and power systems ever produced for a mobile platform in Starfleet history (the systems would even have to prove better than those used on some frontline outposts). Complicating matters further, construction would have to be completed in absolute secrecy with many of the components only being brought together for final assembly to avoid potential risks to the costly ship. The initial designs for the Enterprise highlighted the militaristic nature of the ship more than relying on the design ethics of the past. Initial concepts for this vessel were little more than beefed up Defiant Class Escorts with just more weaponry added to the hull structure. The starship even proved to be so important that the production of the design briefs alone brought together several of the Federation’s most experienced designers for construction of the colossal ship. In a shocking turn of events, nevertheless, the final design for the Enterprise didn’t come from one of the many engineers that Starfleet had assigned to this project. Instead the final design came from an Ensign on his first assignment in Starfleet service and was originally intended to be a galactic exploration craft intended to replace the Intrepid Class Light Explorer. The vessel, which was originally to be called the Pennsylvania Class, was quickly reassigned to the Enterprise Class Development Project to serve as the official design for this historic next generation starship. The designs were partially reworked under the direction of their designer and were brought up to the standards of design that Starfleet was seeking for the next Starship Enterprise with the proposed completion of construction to be completed in approximately 25 years. Combining all of the latest developments in Federation technology, it was predicted that the new Starship Enterprise would become one of Starfleet’s most effective designs since the Constitution Class of the 23rd Century. Because of this lofty goal the eyes of the Starfleet Admiralty were locked on the project so closely that even one minor mistake could have brought the entire project crashing down and destroyed the careers of everyone involved. 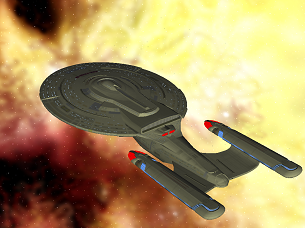 The Enterprise Class was originally created as the Venture Class by madeinjapan1988. Conversion of the model to Star Trek Bridge Commander was completed by Cliperkins. Images of the Enterprise Class were created by AdmiralTeagarden.